This is a great place with a great energy. At first I was a bit thrown off and thought it was a party hostel(which it can be if that's what you want), but there are other opportunities as well. I would definitely go back if I am ever in Paris again. The employees are wonderful as well. They were are very sweet, knowledgeable, and enthusiastic. Great atmosphere and nice rooms. It was definitely clean and the bar downstairs was always crowded with a great atmosphere. It's quite far from most things in Paris, but it's right next to 2 subway stations so it's really easy to get anywhere using those. The room we got was a little bit pricey, so the value for money was not ideal but its definitely a good option if there's nothing cheaper. The place is really nice, and the club is great to know people and drink. It offers good discounts to people in the hostel. The only annoying thing to me is that the lounge (common place to hang) is not open 24 hours, and sometimes you have to eat on the bar, and you are not in the mood to listen to music or people shouting. 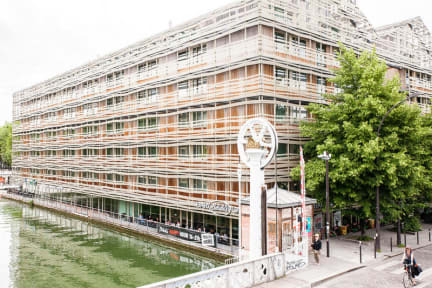 Nice hostel in a fantastic neighborhood of Paris, on the banks of Canal St Martin. The staff was friendly and the facilities were ample. I stayed in a girls' dorm, but the heavy curtains on the bed prevented people from having much interaction. Best suited for tourists who are in Paris for their first trip. I would recommend this hostel for people who want some space. Decent hostel with a location in a residential area. It's a ways out from most major attractions, but there are several metro lines within a few minutes' walk. Had some mild cleanliness issues in the bathroom that were not addressed when reported, but it was very busy while I was there. Staff were generally nice and helpful. Well secured. I'm not in a rush to go back, but the hostel represented the St. Christopher brand well. I generally loved the place, and the staff is great. My one complaint is that the handicapped bathroom right next my girlfriend and I’s room always stunk. There nothing visually dirty about it. It looked clean, but smelled as if urine had soaked into the floor under the toilet. Also the shower was just in that handicapped bathroom, and as a man boarded on the woman’s floor it was the only shower I was told I could use. So I showered two feet from a foul smelling toilet with no separation. Overall the facility is pretty clean. The bunks have curtains, two outlets, and very large lockers. The dorms have a sink in them and then shared hall toilets/showers. The hostel is a relatively far walk from most of the sights you'd want to see, but it's pretty close to public transport. My only complaint is that while the bathrooms looked relatively clean, the smell was unbearable, never went away, and got worse when showering. Because of this I wouldn't stay at this hostel very long.